Basic food sticks providing a biologically balanced diet for freshwater snails. With all important nutrients, building blocks and vital substances. Including carrots, kelp algae, tomatoes and spinach, plus calcium for a strong, well-formed shell. 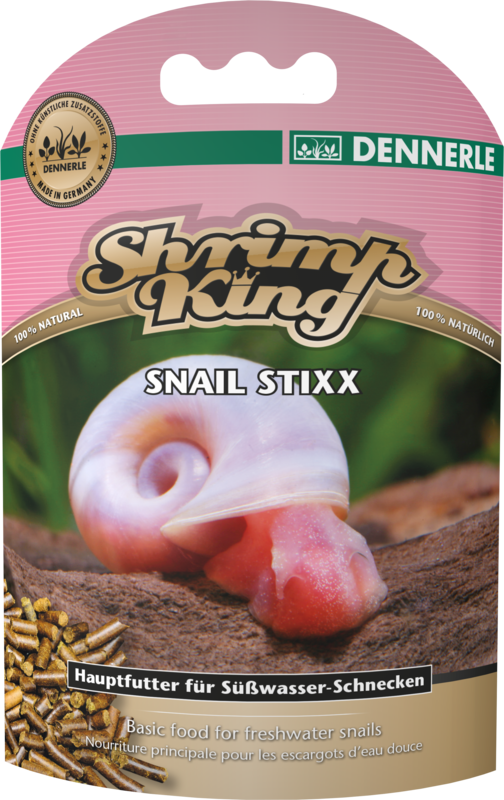 Shrimp King SnailStixx are specially developed basic food sticks providing a biologically balanced diet for freshwater snails. Shrimp King SnailStixx contain all important nutrients and building blocks aquarium snails require every day. The food‘s composition is based on the natural periphyton which snails as “grazers“ feed upon. Valuable vegetables, e. g. carrots, kelp algae, tomatoes and spinach, provide the mollusks with essential vitamins and secondary phytochemicals for a functioning metabolism. Natural fibers promote a healthy digestion. High-quality proteins and essential amino acids from microorganisms provide for a balanced growth and plentiful reproduction. The extra high proportion of calcium offers excellent conditions for a strong, well-formed shell. Each food portion represents a varied nutrition thanks to the numerous ingredients – just like the natural periphyton. Shrimp King SnailStixx are ideally suited for all species of snails feeding off periphyton. Ensures a balanced growth, plentiful reproduction and a strong shell. Approx. 1 cm stick per 5 snails, once a day. Ideally offer on a hard surface (stone, roots, food bowl).